Image credit: NASA, ESA, the Hubble Heritage Team (STScI/AURA)-ESA/Hubble Collaboration and A. Evans (University of Virginia, Charlottesville/NRAO/Stony Brook University). Researchers have found that galaxies forming stars at extreme rates 9 billion years ago were more efficient than average galaxies today. The question astronomers have been asking is whether such starbursts in the early universe were the result of having an overabundant gas supply, or whether galaxies converted gas more efficiently. In general, the larger a galaxy’s mass, the higher its rate of forming new stars — a relation called the star formation “main sequence.” However, every now and then a galaxy will display a burst of newly-formed stars that shine brighter than the rest. 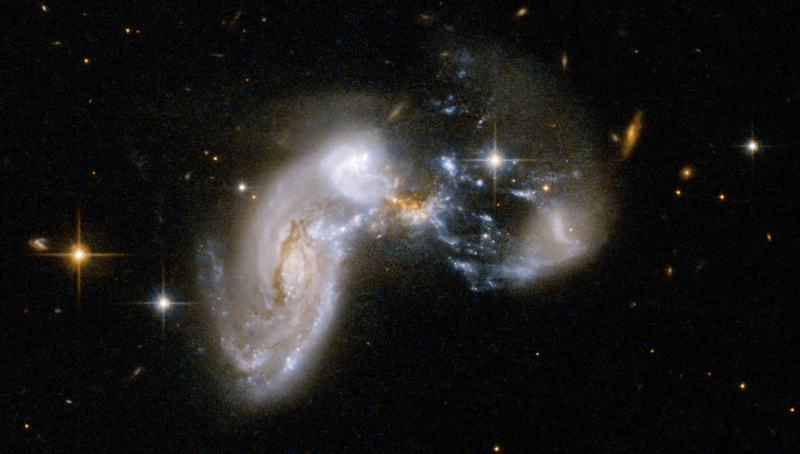 A collision between two large galaxies is usually the cause of such starburst phases, where the cold gas residing in the giant molecular clouds becomes the fuel for sustaining such high rates of star formation. A new study published in Astrophysical Journal letters on 14 October, led by John Silverman at the Kavli Institute for the Physics and Mathematics of the Universe, studied carbon monoxide (CO) gas content in seven distant starburst galaxies when the universe was a young 4 billion years old. This was feasible with the advent of the Atacama Large Millimetre Array (ALMA), located on a mountaintop plateau in Chile, which works in tandem to detect electromagnetic waves at a wavelength range in the millimetre (pivotal for studying molecular gas) and a sensitivity level that is just starting to be explored by astronomers today. The researchers found the amount of CO-emitting gas was already diminished even though the galaxy continued to form stars at high rates. These observations are similar to those recorded for starburst galaxies in the vicinity of the Milky Way today, but the amount of gas depletion was not quite as rapid as expected. This led researchers to conclude that there might be a continuous increase in the efficiency depending on how high a galaxy is above the average rate of forming stars. “These observations clearly demonstrate ALMA’s unique capability to measure with ease a critical component of high redshift galaxies thus indicative of the remarkable results to come from ALMA,” said John Silverman.